ETF: What’s the temp range and the swing of the barrels? I haven’t seen the barrel room, but you said it’s inside of the brewery, so I assume there’s not a whole lot of temp change. Where are you guys sitting, temp-wise, on the barrels? TROY: Ha. I see what you did there… But what are we going to do? I can’t move any of these barrels. This is our only opportunity. I talked to some other brewers locally who are in the same situation where it gets incredibly hot during the summer and very cold during the winter, to the point where the barrels are leaking because of how cold it is. I’ve since come to have the belief that the temperature change, though I’d like it to be less, is very important to the life cycle of these beers. 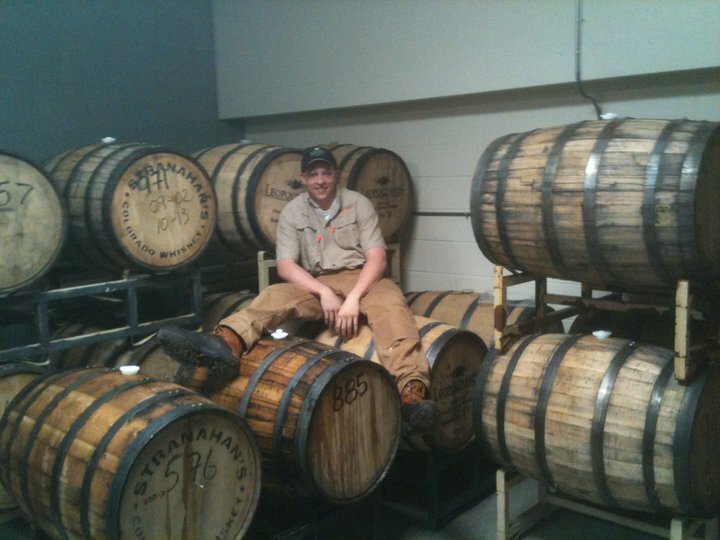 Some brewers control temperature year round with their barrels. I think it’s important to have a life cycle of hot and cold, because that’s what happens with Lambic. Even though we’re not making beer like Lambic, we still have a lot of the same bugs and critters in there. I think that’s important to have some dormancy if it’s cold out, and to get it hot, to let it go a little bit more and get it going. So it can definitely get hot to the point where I don’t sleep at night, but I haven’t tasted a barrel and said, “You know what? I think this barrel just got too hot” or “This barrel is bad because of temperature.” We’ve had plenty of barrels go bad for other reasons, but not because of temperature. ETF: What are we talking on the temp swings inside the barrels? TROY: So the coldest we got a couple years ago, the low 40s degrees Fahrenheit. The highest it can get to is upper 80s. But that’s for short periods of time. I’d say it can get over 90 if our air conditioner trips out, but that’s for a short period. But over a hot summer, it’s routinely in the lower 80s. ETF: So when it gets hotter –and as far as your fruiting schedule goes, how far into the life cycle of that beer are you? How far into fermentation would you be when it does start getting up to the 80s and 90s? TROY: It would either be at the end of the life cycle for a barrel or at the beginning. For instance, last year when June came around, we had apricots. So we emptied a lot of barrels onto the apricots. In turn, we had beer ready to go to refill those barrels, so at the end of June, we had young beer that had just got that starter culture. July comes around, we get our peaches, and that’s when it starts to get really hot. 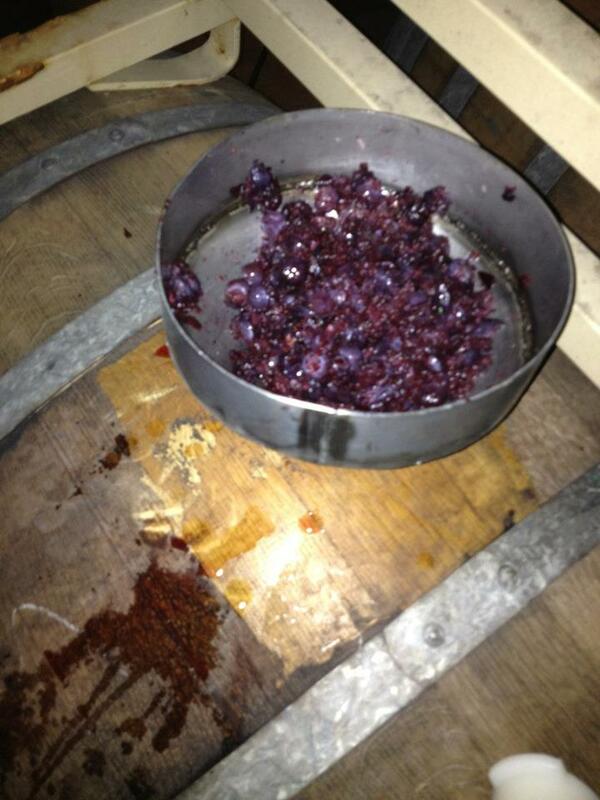 But we don’t get our blackberries until September, so we’ve got those barrels that are 10, 11 months old. We also have fresh barrels that are one, two, three months old when this heat is coming. ETF: Are you guys staggering the microbe additions – are you adding the brett, lacto, and pedio at the same time, or doing brett for a little bit and then acidifying with bacteria? TROY: Whenever we do a store-bought thing, yep, we’re definitely following the “Vinnie method” if you will…just adding the brett first, and then – we actually don’t really buy lacto anymore. We’re almost only using pedio. We haven’t had to do a store-bought beer in a long time, though. Probably 2011 was the last time we bought bugs for this type of project. So from now on, we had the barrels that were the store-brought ones, we add the brett, we add just a little bit less than two million cells per ml of various strains of brett. Let that go for a couple months, and then we’ll add the lacto/pedio. If you ask me why, it’s because that’s what Vinnie says. ETF: Haha …I mean, who’s going to argue with that? TROY: Right? He’s making phenomenal beer. So that’s why we do it. I’ve only been doing this since 2009, so I don’t have enough internal data to say if that’s the best way or not, but it’s making great beer. ETF: Well, you did mention that you guys are using more pedio now than lactobacillus in the beers. Do you feel like the lacto is maybe being suppressed by the alcohol at that point, and that’s why you guys are going with pedio to acidify? TROY: I would say it’s been from the results we’ve gotten. I think at first when we tried it, let’s just say we were 50-50, lacto-pedio when we inoculated the barrels after a couple months with the brett. Then we tried one that was 75% pedio to 25% lacto, and that got more acidic. Now it’s for two reasons; because if it was just pedio, it seemed to get more sour, a more pleasant sour. And it’s easier from a production standpoint, because we only have to deal with one strain of one microbe. It’s just simpler in that regard. When you have to inoculate 20 barrels, it’s easier just to order one thing from the supplier, especially if you know it’s going to give you a better result. ETF: Which variant of lacto were you guys dealing with? TROY: We get lacto and pedio from Wyeast. ETF: When you’re adding the brett, would you consider that a secondary addition, when you guys are adding your brettanomyces? TROY: Definitely. When we first started, we would add wort, or we would do a really under-modified mash to try to leave fermentables left. But it was more of a hassle to do that as opposed to just doing it the way we now know. What I’ve since found out in other processes, we’ve measured the sugar profiles of our fermented beer and learned that there’s plenty of maltose left and even maltotriose left, even in a very highly attenuating yeast strain, like the saccharomyces yeast strain. So I believe there’s plenty of sugars left, even the simple sugars, that saccharomyces could ferment. There’s plenty of simple sugars left in a normal beer that brett can chew on, no problem. So from that standpoint, you’ve got fermentable sugars left; then it comes down to pitch rate, when it comes to the flavors that you want. Usually, to just simplify it, if you under-pitch, you get more flavors, either positive or negative, from whatever yeast strain you have. I believe with brett, it’s nicer to have the pitch lower than you might with saccharomyces, because the flavors that can come from stressing the Brett are vital to character. So when we pitch, we do less than two million cells per milliliter, total. That’s in the barrel. 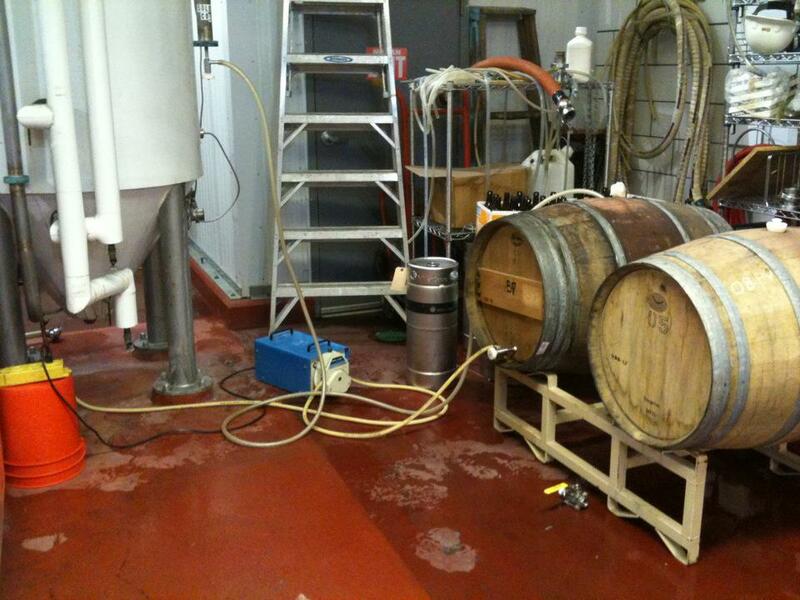 As soon as we fill the barrel, we add the Brett. TROY: We have done one with a popular beer that is made in Golden. But I couldn’t tell you what the pitch rate was at all. We had some brett laying around, we just used that. It was interesting; it wasn’t any better than anything our normal yeast made. ETF: Okay, going back on the fruit for a second, there was a question that one of the readers of the blog had. What are your thoughts on when to add fruit? A timeframe for adding and then packaging the beer is what I think they are asking. TROY: The peach sour that you had was the traditional lambic way I believe. You let it sour in the barrel, and then once the beer is sour enough, you add the fruit. That was our second batch of our Peche. 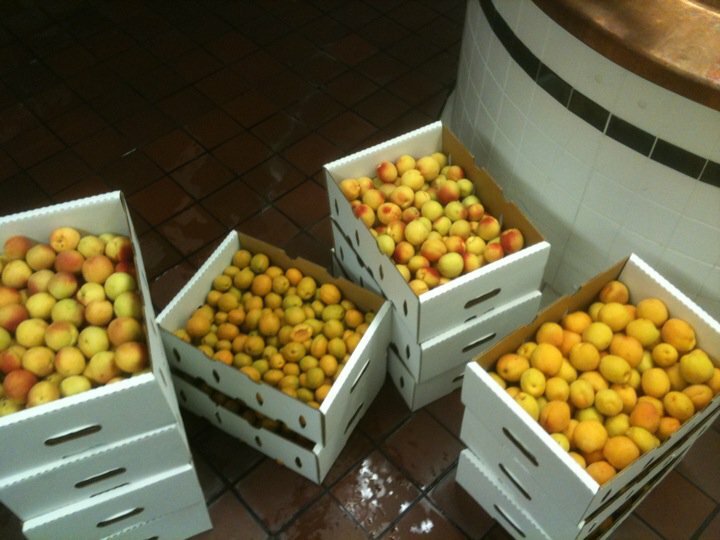 The first batch of Peche, we added peaches into the barrel when we filled the barrel. Later, we added the lacto and the pedio. It’s just a different flavor. The fruit, the bugs, the brett, whichever saccharomyces we’re using ferments the dextrins in that fruit significantly. We had a 5% alcohol lager go on 2 pounds per gallon fruit and when it was done, it was 8% alcohol. That definitely came from the fruit. As opposed to the peach sour that you’re trying now it was 5.4% alcohol when it went onto the fruit; when it was done, it was 5.7% maybe. And that was after two, three months. Only the simple sugars were consumed. From the fruit flavor standpoint, which is what we want, it’s a method of preservation, preserving this fruit character. 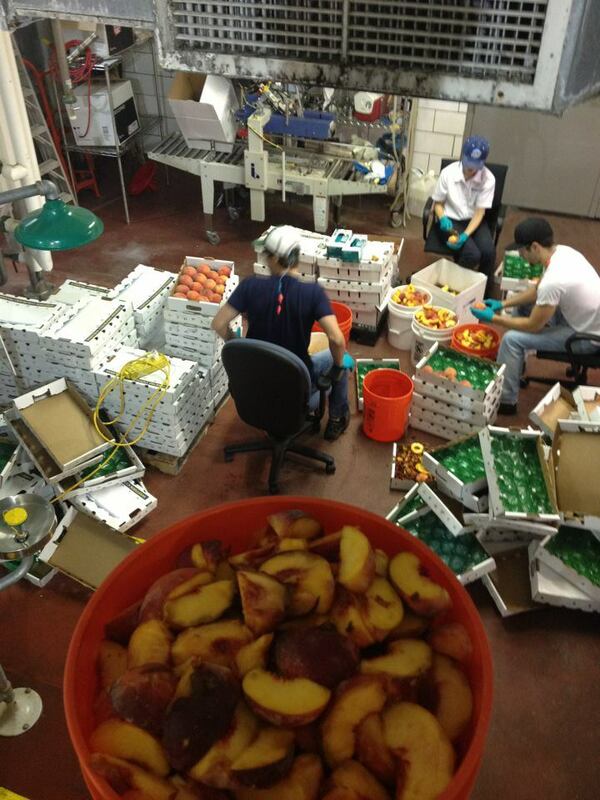 Because you’re not going to find any Palisade peaches right now in Colorado that are fresh. This is probably as fresh as it gets. So from that standpoint, we put it in as late as possible. We had barrels that we were happy with, that we did not expect would get more sour and we were happy with everything. All we wanted at that point of addition was the fruit flavor. So just let it go for another couple months on the fruit and filtered the fruit out with just a coarse filtration and packaged it. ETF: So on the Peche batch that I had, what are we talking about as far as pounds per gallon of fruit? TROY: I think technically somewhere around 1 ½ pounds per gallon. ETF: And that was whole fruit, right? You guys only use whole fruit. TROY: Yep only whole fruit. The Apricot is 2 pounds per gallon. ETF: We were talking earlier about the acidity of Apricots and when I’ve tasted beers like Fou’ Foune, I’ve always felt like they were so smooth. But would you attribute that to the different types of apricots, or is that just something with apricots in a whole? Because I’ve never brewed with an apricot before. TROY: I know what Cantillon says about their Fou’ Foune is that they can’t leave it on the fruit for more than two months because they think there’s some sort of yeast strain on it that can cause it to sour too much. I’ve only used whole apricots twice, so I’m by no means an expert, but what we found is that it sours really quickly too. I don’t believe it’s from a yeast strain; what I think is there’s more acidity in an apricot, and when you taste an apricot, you might not think it’s acidic, but it’s because of all the sugars that are there. The longer you keep it in contact with a yeast strain that can ferment it, that A) ferments out easily those simple sugars, but then B) can go even deeper and pull more out. I think that’s where the increase of acidity comes from. I know when you age Fou’ Foune it becomes almost undrinkable, some people say. From the actual production side of it, I think it’s just a sour fruit that doesn’t come off as sour because of all the sugar that’s in it when you actually consume it, like so many fruits are. There’s a lot of different types of acid in them. With apricots, it’s a very dense fruit. It’s not like peaches that’ll just melt. For a lot of people it’s not enjoyable because of the texture of the fruit. But there’s plenty of sugar in there, especially when you get them fresh and you rip them apart, and the juice is just dripping out. It’s just pure sugar and pure flavor. It’s amazing. But there’s a reason why apricots are not as popular as peaches, because they’re not as flavorful for the human palate. You put it in beer, you get phenomenal flavors, but you also deal with the increased acidity. ETF: As far as water profiles, have you done any research or just played around with water profiles when brewing some of the beers that you guys are doing? TROY: We just add a little bit of calcium chloride. ETF: Are you guys doing that just to bump it up for yeast health and flocculation? TROY: We use a little bit of calcium and it doesn’t hurt us. I’d rather have less calcium, I think, than more, mostly from the flavor standpoint. It has nothing to do with the technical brewing of sour beers. Sour beers are so much fun because I don’t have to worry about every technical aspect of it. Every day I come into work and I have to worry about micro-stability, I have to worry about not infecting our production beers. But when I get to make sour beers, I don’t have to worry about if this beer’s going to be ready in two days for transfer or packaging. What’s so much fun about Lambic in general – not that I make Lambic, but a great quote, I think from Pierre Tilquin: he likes Lambic because all its secrets haven’t been revealed yet. That’s what I love about sour beers. I don’t have to worry about all these things I normally worry about with any of our production beers. It’s just fun; it’s all art. I mean, obviously there’s a huge amount of science in there, and Chad’s the one that can tell you that science. And that’s great, there’s nothing wrong with that. But I love sour beers because I don’t have to worry about that. It’s all about the flavors and it’s all about production methods. So that’s where I think my skill is in making sour beers and the production methods. Not so much the science behind it, but the production methods. ETF: What would you call the distinction (besides the obvious) between an American Wild and a Belgian Lambic? Is there any flavor profile or characteristic one has, the other doesn’t? I’m always curious to hear what brewers have to say about the name game. TROY: I think it’s really well summed up by saying American Wild Ale as opposed to Belgian Lambic. Because what we as Americans are making, for the most part, is much different than what the Belgians are making. Not from the spontaneous inoculation side, but just what we’re trying to achieve. I can talk about that from what we’re making. We’re really not trying to have the same flavor characteristics that the Belgians are. We have some similar ones, but not the same. When we make sour beer, the thing that we’re looking for is acidity. And that’s not what the Belgians are looking for. Obviously, it needs to be there, but for the American brewers, I feel like on the most part that are making American Wild Ales, we have to wait until the beer becomes sour, and then we can do something with it. On the Belgian side, the acidity comes very early in the process. The sour is not hard to get at all. You and I have both tasted a lot of American sours that aren’t that sour, and in that respect can be hard for American brewers, because we like to use a lot of hops. So it can be hard for American sour producers to make beers that aren’t too hoppy. Hops impede the acidity of their beer, right? TROY: The difference is that American brewers are waiting for the acidity to form until the point that they can sell it, whereas the Belgians, the acidity is almost the least of their problems. They’re waiting for the flavors. So the acidity comes early for Belgian brewers, and then flavors develop secondary, almost, and that’s what they’re making their beers based on, flavors. The acidity for Belgian brewers, in my opinion, is almost just a necessary evil. It’s the flavors that come with that that are making their beers so great. As opposed to a lot of American brewers – I would say myself included – who are making beers that are sour. Their #1 goal is to make it sour. Secondary to the acidity are the flavors. That’s what distinguishes a great American sour brewer from a mediocre one, is that you’ve got the acidity, but you’ve also got the flavors. I think that’s the hard part about making sour beers in the United States. ETF: Thoughts on how you think the Belgians are getting those flavors and Americans aren’t? TROY: Oh, I would love to know the answer to that question, because we could all be millionaires. TROY: But that’s what’s so much fun about making these sour beers, if you ask the Belgians, they probably would tell you they don’t know, and they probably wouldn’t be lying to you, because they probably don’t. ETF: And that’s why I love them. TROY: I’ll tell you what, I don’t want to know, because that’s what takes the fun out, right? If you know how the magic trick works, then you don’t really care about it anymore. I believe that wholeheartedly. So I think the question you should be asking – and I’m sure you are – is how could you find these flavors? Not how do you do it, but how do you find the flavors? By finding the flavors, you don’t have to necessarily get them the same way the Belgians do, but how we do it from an American standpoint. I think from an American standpoint, it just takes time. There are almost no American brewers that are just making sour beers 100% spontaneous that can dedicate all their time to letting these beers age so they can have the flavors that they want to. That’s a tough thing nowadays. Everybody wants to see a return on their investment, and it’s more like a winery when you have to let these beers age to get to the point where you’re ready to sell them. When we made the blend for the apricot and peach sours, we knocked out 15% of the total beers we had available to us, because some of them were just undrinkable, they tasted terrible, but the majority of the beers we kicked out were just mediocre. Maybe we could have used some of them as a one-off or something, but we just didn’t want it in our beer. So we chose to have less great beer than more mediocre beer or average beer. I think that’s what Americans need to realize, that you can’t just put it in a barrel, let it sit for a year, and have it be anything that’s even close to ready. I’m not saying it needs to sit for two years, but I think it’s more about the production methods. ETF: That kind of leads me into one of my last questions. What kind of advice would you offer to home brewers. 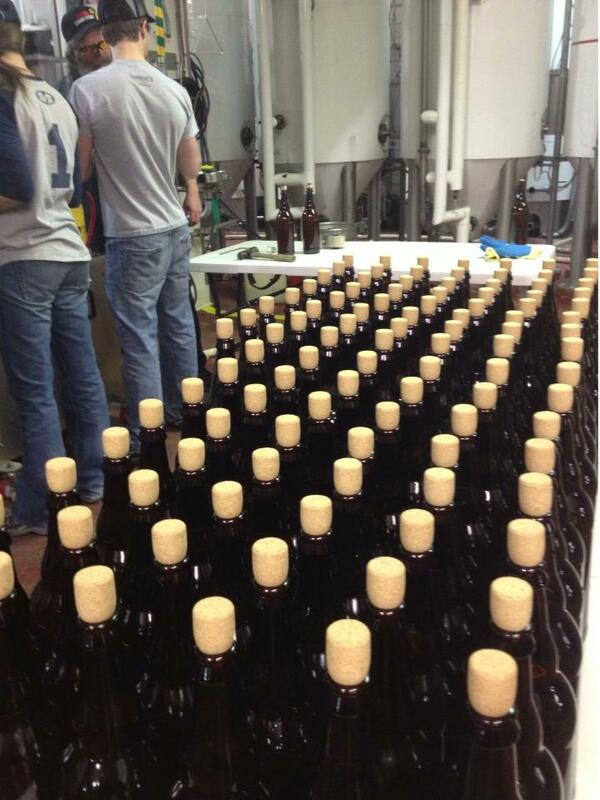 What advice would you offer these guys to be successful when they’re going down the sour and wild road of brewing? I think the same is true for home brewers. Home brewers don’t have unlimited amounts of time to brew, just like professional brewers don’t. So you have to decide if it’s worth it to you or not to spend that time on making a beer that you’re definitely not going to be able to drink for a long time, if ever. That has to be worth it for you to take that risk. Maybe do a group brew where you fill a barrel in a day. You only have to brew five gallons, but collectively, it’ll fill the whole 59-gallon oak barrel. That’s fun and at least everybody’s passionate about the project and you can get the details worked out, so that’d probably be a good way. But I think blending is really important from the homebrew standpoint. You’re going to have to brew a lot of batches to figure out how you can make sour beer that works out well for you. All it takes is that initial brew day and the carboy. Even if you put something in the corner and ignore it for months, if you’ve got a lot of other things going on, it’s only the brewing time that is tough to find. If you’ve got pale ales and other beers that you really enjoy, it’s easy to forget about something for 6 to 12 months. But the more you can do that – and those are small investments, to get a little plastic carboy or a glass carboy or whatever has a good amount of allowable oxygen, then it just takes time to actually brew it, and to know that you’re spending a whole day brewing something that you’re not going to taste for at least a year, if ever. Or you could brew something else that would be ready in two weeks, and oh, by the way, your wife likes it. Haha! That’s obviously very, very important. ETF- I’ve really only got one more question, and it’s almost a general question, but as far as sour and wild brewing goes, is there one thing that you’ve found out in your journey over the past four years, five years you said, “Wow, hey, I didn’t know that. That’s pretty darn cool”? TROY: That’s a good question. That’s a great question. I have to say the idea is just let it be. For example, the Framboise Noir, the base beer for that was probably the second or third batch of a dark sour that we ever aged in oak. That beer was about a 14 or 15 plato beer. It was 2% carafa dehusked, 8% special B, and the rest was pale malt. Really simple, but a lot of roast. We probably did the roast because of the color. Anyway, I remember tasting it out of the barrel and it just tasted like a roast beer, almost like a Stout. And I thought, “Man, I screwed this entire batch up because I added too much of that.” But then we let it sit for another couple months and now – we’re talking maybe at six months we tasted it like that, and it had that roast – two months later, it was an entirely different beer. I’m sure you’ve heard it before, but I love when Lauren Salazar talks about how you have to let the base beer die to become something new. That is the most important thing, I think, in making sour beers. That you can’t worry about putting a great beer into the barrel first and expecting a great beer to come out. Our golden sour, the base beer that’s in the apricot and the peach, is the worst beer I’ve ever had in my life when it goes into the barrels. It’s overly sweet, it’s just full of diacetyl because we didn’t let the lager yeast take it back up. So it’s literally one of the worst beers I’ve ever made. It goes into these barrels, and within 8 to 10 months it’s actually drinkable; within 12 months total, it’s usually really, really good. Then you put the fruit in there for another few months and it’s what we’re drinking. The same thing happened with the dark sour, but that one specifically is the one I can remember tasting and thinking, “Well, I put too much roast in this. It’s unsalvageable.” The roast is the last thing I think of when I try that Framboise now. It’s the last thing on my palate, if it’s even in there at all. There are just so many other flavors going on in that base beer that the roast is a negligible thing. You have to get rid of all your preconceived notions about brewing from an American or English standpoint, even a German standpoint of brewing. The flavors that these beer styles give you initially in a beer can be thrown out the window because when you age them for another 11 months, they’re completely different. The bugs, the yeast that you use are transforming those flavors into something totally new. I think that’s what a lot of brewers make a mistake on, is they’ll just take a beer that they currently make and then add lacto to it and expect something that’s heavenly, but you can’t usually do that. You have to be okay only adding a handful of hops to a 30-barrel batch, as opposed to what you add with in an IPA, when you’ve got more hops than you do malt sometimes. You have to be okay doing that. You have to be okay putting a beer into a barrel that would be the last beer in the world you would ever drink, but in another year it’s going to be delicious. I would say that’s the biggest thing, and I think that’s the biggest fault when it comes to some American brewers that are making sours. It’s the same way if you’re making an IPA and then the next day you make a golden ale. You don’t feel comfortable adding such a small amount of hops. It’s no different in that regard, but it’s just coming down to the process. You have to know what you want in the end, and know that it’s okay to add such a small amount of hops. I think hops usage is the biggest one. We talked about it before, and Chad and I talk about this all the time. You don’t need to add that much hops to make American Wild Ale, and I think that’s a big point. Many thanks to Troy for spending so much time talking to me for this interview. We covered a lot of ground in this interview. It’s obvious that his passion and knowledge for making great sour beers is translating into a great product. It was really fascinating to hear the sour brewing details from inside AC Golden, a place I think many people would be surprised is turning out tasty funky beers.